These servers are intended to handle the user requests. Therefore they are optimized with lower latency. SharePoint Web Applications will be provisioned within the Front-End servers while Service Applications and Services are also possible. Optimized for processing back end services such as background processes, and some service applications. These services are optimized to provide higher performances through high throughput. Service applications, services and other components that require distributed caching are stored in the Distributed Caching servers. Services and service applications that require search service functionality are stored in the search servers. Anything that does not fit into MinRole are provisioned through custom servers. The farm administrator has full control over which service instances can run on servers assigned to the Custom role. MinRole does not control which service instances are provisioned on this role. A Single-Server Farm is meant for development, testing, and very limited production use. 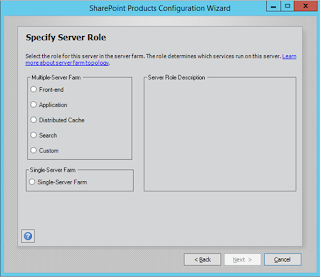 A SharePoint farm with the Single-Server Farm role cannot have more than one SharePoint server in the farm. A Single-server farm does not mean that is a Standalone server which is unavailable with SharePoint 2016. Unlike in Standalone servers, administrators must configure a separate SQL Server installations for Single-server farms. Does this mean do I need at-least 4 servers for SharePoint installation? No, it does not mean that. You can go with a Single-server farm or either have your own architecture with Custom servers. Its just that it will not be fitting into MinRoles as performance optimized, but who knows, you may come up with better performance depending on the services you consume. One clear change came to SharePoint with MinRole deployment is the number of required virtual machines go up. Some might look at this as a costly option but with the distribution of the servers, performance requirement for a single server may go down. Also given many organizations moving their SharePoint environments to Azure, this might be much cost effective than the Custom deployments. At least a single core server role is required to fulfill the minimum 100% MinRole requirement. That means 4 servers for SharePoint. If you are looking at a production environment where you may require High Availability, you need 3 servers for Distributed Cache as a cluster quorum and 2 servers each for the other core server roles. Which means 9 SharePoint Servers. Considering the requirement of Always On for SQL Server where you need 2 SQL Server machines and probably one or more Workflow Manager farms depending on the topology that will be chosen, the number of machines require may further go up. Also there are some typologies recommended by Microsoft for MinRole as follows. Required for Content Farm ? Required for Shared Services Farm ? Required for Search Farm ? Having a MinRole deployment would be great, but its always better to do a strict evaluation on the expected load on the servers. If it is very low, you can survive with a Single-Server Farm. Then consider servers with Custom MinRoles. After that start with a minimum 100% MinRole and move forward. It is likely that Microsoft might put out some numbers that will help decision making in future. 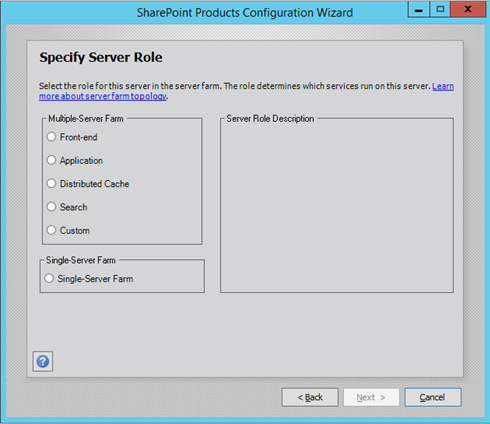 So till then, tryout a Beta 2 Server setup with MinRole for SharePoint 2016.